For the original “Hands On” review of Samsung’s RVU-capable TV, click here. 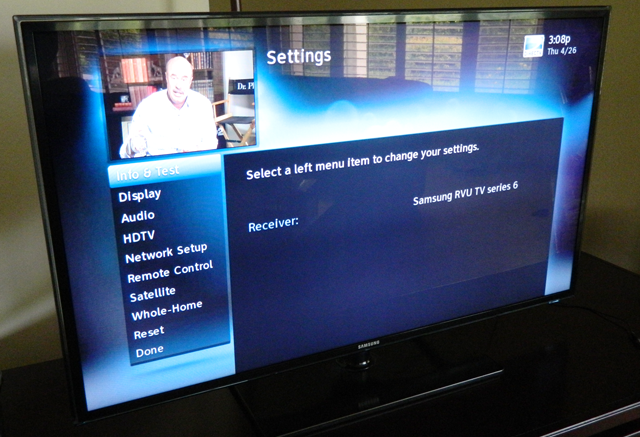 It’s been a little over two months since my initial review of the Samsung Smart TV with DIRECTV RVU support. In the meantime, Samsung has released the 2012 models. I’m hoping to do a review of RVU with a newer TV but for now, let’s compare apples to apples. It’s been a busy time for the HR34 Super DVR. The biggest change came with the introduction of HD menus similar to those used on the other DIRECTV HD receivers. This was a welcome change. A menu doesn’t mean a lot, but it was beginning to chafe me a little bit that my “lesser” DVRs looked all modern and this one did not. More importantly, significant work has been done on the RVU client and I have to say, it’s almost to the point where I could enthusiastically endorse it. Fast forward and rewind have improved dramatically, although they’re not as smooth as an HR24 DVR. The whole system feels more responsive as well. I’m really pleased with the direction that they’re going here. A while back I had an issue with Samsung’s 1028 firmware, and for the most part things have settled down there. After a long stretch with Samsung’s tech support didn’t solve the problem, I tried a basic diagnostic tool: I unplugged the TV and plugged it back in after 30 seconds. This solved the problems I had, and while the problems come back occasionally, all it takes is an unplug/replug and things are back. For the record, I haven’t seen the problem come back for about 10 days now. I have seen spontaneous reboots from the television, but they are similarly rare and not limited to RVU. I’ve seen such reboots on Netflix and MLB.TV as well. It’s … almost… there. There are still some concerns, but they are now more in the “occasional” category. Sometimes something doesn’t behave quite right, but the system has been stable and is looking more and more like the kind of product you’d trust to the general public. Probably the biggest complaint is that my HR34 now has nice shiny HD menus but the menus on the RVU TV are still blurry. They look like the HD menus, all nice and black, but they’re fuzzy like the old blue ones were. I suspect this is to make them load faster, but I can’t help thinking the RVU client should have the same menus as the server. I also notice that if I set the RVU input to the same levels as the HDMI input, the RVU is dimmer, especially on menus. Samsung TV’s have an auto-dimming feature to increase contrast and although you can set the option to “off,” it never really turns off. I suspect that it’s a little more aggressive on the RVU input than it is on HDMI. This is a known pet peeve on 2011 Samsung TVs across the board. DIYers should also note that the PS18 Power Supply is no longer available. A replacement is expected but DIRECTV hasn’t released it. In the meantime, instead of the DECA and Power supply, use a Cinema Connection Kit; the results will be the same. In the coming months I expect a lot from the Samsung RVU TV, and I think the 2012 TVs with their dual-core processors will also make a big difference. I’ve also heard the occasional rumbling about a standalone RVU adapter for older TVs, but so far nothing concrete.